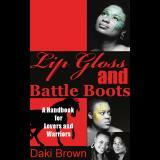 Lip Gloss and Battle Boots: A handbook for lovers and warriors, and is a collage of fiction, non-fiction, essays, plays, and poems. It's a literary gumbo for the open-minded reader. The Secret: We (Daki & Brown) wrote the book together, over good music, good food, and Pinot ;) The Tip: Writing a book with a friend is fun, but challenging. So stick to the goal, and respect each persons input. The Story: After meeting in a women’s writing workshop in Washington, D.C. Brown, who is pursuing a Masters in Fiction from Wilkes University, approached Daki about putting a book together that would include both previously published pieces and newer works. The two 20-something writers used positive themes of giving, loving, and being true to one’s self to tie the collage of writing together. Both admitted “book geeks” understand that many in their generation may not jump at the chance to read haikus, monologue, or literary fiction. So they decided to conceptualize the handbook with “rules” and recommendations for everyday life. “We wanted to actually give our readers a way to utilize our art” says Brown. Each poem, story, essay, and short script correlates to a rule, and is separated into either the lovers or warriors section of the book.